To celebrate Easter I present two super villains that aren’t remotely themed to Easter, Spring or anything else. Huzzah! Dexter Finkel was well liked. He was funny, terribly sarcastic, hard working and generally regarded as a “good guy”. He was also miserable, because being a good guy, and a good guy weighing north of 260 pounds, wasn’t much help with the ladies. He’d tried just about every diet plan conceived by modern man (except exercise and eating less, it should be noted), but one disappointment and he was right back at the burger stand (Mister Patty, with seventeen locations around Shore City for your convenience) and the double patty bacon blast with fries and a shake. It was after on such binge that he awoke to an advertisement on the radio – Wainwright Labs seeking overweight people to take part in an experimental weight loss drug. Dexter grabbed his phone and, after a few questions, got himself on the list. The drug worked well, at first. He started shedding pounds, though it made his teeth ache, and had himself down to a slim 180 when a minor rejection from the receptionist at his office sent him right back to Mister Patty. Only this time, he couldn’t stop at one double. After four he felt something must be wrong, because he not only didn’t feel full, he was growing. After ten, he’d put on 200 pounds and 3 feet and it wasn’t stopping. Naturally, a rampage resulted that only ended when Fantome used her natural charisma to distract him long enough for Miss Victory to put the hammer down on the 10 ton, 15 foot tall Dexter Finkel (and by hammer, I mean bulldozer). Nicknamed “Super Size” by the Daily Herald, Dexter is now serving time at Iron Island, where positive affirmations and a very controlled diet are temporarily keeping him from being a threat to himself and others. 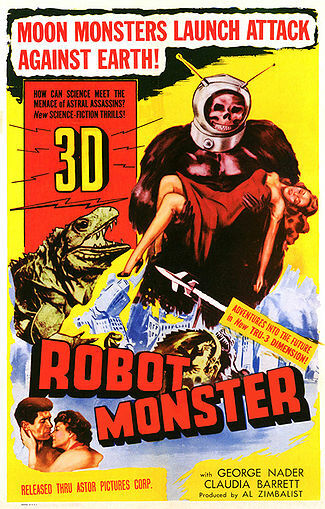 Out in the cold depths of space, there exist a race of cyborg apes called Ro-Men. For ages, these apes have watched the advancement of human beings and now they are beginning down the long road to mankind’s destruction. Their advance scout is Extension XJ-2. His mission is to lay the foundation for man’s destruction, starting with the sabotage of his space programs. Unfortunately, Ro-Man’s activities brought him into conflict with Rocky X and his Rocketeers, and he found his plans delayed, if not stopped entirely, by a stint in Iron Island. He still manages to send short messages to the Great Guidance via his antennae, and still plans to finish his mission when he finds a way out of prison. Cool. Nice to the Ro-Man getting his due. I was watching him last night on MST3K – had to add him in. Best of all, he's public domain, so the Ro-Men will probably appear in Mystery Men!